In an effort to promote the increased use of compost and mulch, the California Integrated Waste Management Board has released a free video entitled "Two Green Thumbs Up" highlighting demonstrations of compost use in agriculture. In addition, the Waste Board has developed a new website at http://www.ciwmb.ca.gov/organics which provides information on the beneficial uses of organic materials, including results of the demonstrations and a source listing for compost and mulch. The video highlights the benefits of compost use that were discovered during demonstration projects in Alameda, Fresno, Monterey, San Benito, Santa Clara, Stanislaus, and Tulare counties. Featured in the video are farm advisors, growers, researchers, and compost and mulch producers who participated in the demonstrations. Some of the benefits addressed in the video include increased organic material in soil, increased plant health and vigor, an increase in moisture retention, and a decrease in fertilizer and pesticide applications. The Board’s new organics website complements the video by supplying visitors with detailed reports and contacts for the demonstration projects. In addition, along with information for commercial landscapers and home gardeners, the site offers information on the Board’s recently adopted comprehensive Greening Team Plan, which identifies the targets for reducing the disposal of compostable materials over the next year. Since 1990, California cities and counties have been aggressively working to reduce the amount of waste entering landfills, in an effort to reach the state mandate of keeping 50 percent of waste out of landfills by 2000. In order to meet this mandate, reduction of yard trimmings, which constitute more than 25 percent of the overall waste stream, is becoming an increasingly important tool for communities trying to reach the 50 percent milestone. The demonstration projects are designed to promote sustainable markets for yard trimmings, as compost and mulch in agriculture. To receive a copy of the video, call the Waste Board’s Organics Material Management Unit at 916-255-2410. Few things are as important to our day-to-day lives as water. According to the 1997 National Consumer Water Quality Survey, three-quarters of American adults are concerned about the quality of their household water supply. For those consumers, a few simple steps are recommended. Purchase an in-home test to gauge the hardness of water and the presence of minerals. Call your water utility to request a list of contaminants in the water supply. To have your home's tap water tested for specific contaminants, contact your water utility. It will work with a state-approved lab to test water for health-related contaminants. Research which water treatment device you need. To match treatment technology to your specific concerns, talk with a certified water quality specialist. Check products' capabilities, warranties, maintenance provisions and general operating instructions. Look for the Water Quality Association Gold Seal on products, which indicates a product has been tested and meets performance standards. For health-related contaminants, look for seals from the Underwriters Laboratories or the National Sanitation Foundation. To learn more about water treatment options or the Water Quality Association, call 800-749-0234 or visit http://www.wqa.org. The Department of Energy's (DOE's) Clean Cities Program is a locally-based government and industry partnership coordinated by the Department of Energy. It is designed to promote the use of alternative fuels and alternative fuel vehicles, cleaner air in major U.S. cities and reduced dependence on imported oil, while stimulating local economic activity. A toll free number (1-800-CCITIES) is available for communities interested in joining the program. EPRICSG, a subsidiary of the Electric Power Research Institute, has announced the launch of the PowerShape portfolio. PowerShape includes a CD-ROM collection of multi-energy, weather-adjusted load shapes for the major commercial and residential market segments in the United States. These market segments cover the regions most likely to be hot spots for energy competition. The data is easy to read and manipulate in Excel spreadsheets and spans 996 different segments across the United States. Primary emphasis is on states with emerging retail access programs. EPRICSG will offer training on interpreting and manipulating load shapes and understanding how they are affected by weather, energy use patterns, or technology purchases. Also, EPRICSG will provide two days of consulting services from the Center for Energy End-Use Data (CEED). EPRICSG specialists can, on request, help customers create and analyze load shapes to answer very specific questions. For further information contact the EPRICSG Retail Market Assistance Center (RMAC) at 1-800-766-3774, 3010 LBJ Freeway, Suite 300, Dallas, TX 75234: or rmachelp@epri.com. Chicago-based Gas Research Institute and E SOURCE Inc. have developed the first comprehensive directory of the leading energy service providers in North America. The directory -- Energy Service Provider Intelligence Online -- is available for a fee online and in print, and features profiles of more than 120 non-regulated energy service companies (ESCOs) in this rapidly growing market as well as the products and services they provide. The directory also provides insights into each company's target sectors and market coverage. For more information, contact Gary Sunshine, ESPIO product sales manager, ESPIO Directory, 4755 Walnut Street, Boulder, CO 80301, at 303-440-8500 or fax to 303-440-8502 or e-mail gsunshine@espio.com. Information is also available from GRI's Larry Dombrowski at 773-399-8323 or fax at 773-399-8170 or e-mail ldombrow@gri.org. E SOURCE is a membership-based energy information company. More information is available at http://www.esource.com. GRI manages cooperative R&D programs for its 335 members and the natural gas industry. GRI's Web site is at http://www.gri.org. The ad hoc State and Local Government Electric Industry Restructuring Coalition represents state and local governments that have a policy interest in electric industry restructuring. The coalition will invite Federal Energy Regulatory Commission officials, congressional staff, administration representatives, and the Federal Trade Commission officials to make presentations at future meetings. Issues of interest to the coalition include Federal legislation, electric system reliability, price "spikes," consumer education and public benefits. For more information, call Jeff Genzer at 202-767-6370. The Electric Vehicle Association of the Americas (EVAA) has introduced the first comprehensive CD ROM on electric vehicles, or EVs. "This CD was developed to help increase consumer awareness about electric vehicles and to help advance the development of a mainstream market for EVs," said EVAA executive director Robert T. Hayden. "Of course, the best way to learn about electric vehicles is to drive them. But not everybody can get out to test drive an EV. So, we thought we'd put the car into your computer and take you on a ride into the world of EVs." The CD ROM uses a variety of audio visual techniques, including video and animation, to show users how EVs work, EVs available for purchase, the basics of charging systems, why EVs are safe, future industry trends, and contacts for more information. The CD ROM is available for $39.95 and can be ordered by visiting http://www.evaa.org/store/evcd.html. The Alameda County Waste Management Authority & Recycling Board has released a comprehensive Resource Catalogue – a compilation of free resource materials and services available to help reduce, reuse, recycle and compost. The catalogue includes a convenient tear-off order form to obtain brochures, guides, videos, reports and studies, technical assistance, and other useful information to keep materials out of our landfills. 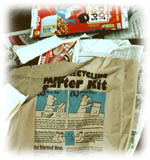 Many of these items are also available on-line, or may be ordered electronically, through the agency web site located at http://www.stopwaste.org. Persons or organizations interested in obtaining a free copy of the Resource Catalogue should contact the Alameda County Recycling Hotline, toll-free, at 1-877-STOPWASTE, or via e-mail at acwma@stopwaste.org. Its purpose is to help states and local governments reform their planning statutes. The second edition contains new chapters on local planning and integrating state environmental policy acts with local planning. The Minnesota Department of Natural Resources has launched a website focusing on ecosystem-based management. It stresses the importance of building cooperative long-term alliances to attain sustainability. The website includes a guide to ecosystem-based works-in-progress in Minnesota. The Alliance to Save Energy is offering an online energy checkup to help business owners identify the benefits and costs of energy efficiency options. The checkup guides businesses through the five stages of EPA's Energy Star Buildings program to identify ways to reduce costs, energy use, and air pollution emissions. For your checkup, visit http://www.ase.org/checkup/business. New software allows communities to establish indicators of sustainability and measure the impacts of decisions in advance. It also allows developers to plan best development practices and avoid permitting delays. The Sprawl Watch Clearinghouse is a new resource center providing information, advice, and referrals on issues related to sprawl and smart growth. It helps neighborhood organizations, public officials, developers, architects, planners, policymakers and others revitalize existing communities and reduce urban sprawl. For more information, contact Sprawl Watch Clearinghouse, PO Box 33144, Washington, DC 20033-0144. Phone 202-387-9858 or visit http://www.sprawlwatch.org. According to the International Institute for Sustainable Development, this new website "integrates the online information developed by a network of some of the world's leading sustainable development institutes." The site includes a sustainable development primer covering 150 topics and providing links to more than 1,600 documents. Visit the Sustainable Development Gateway at http://sdgateway.net/noframe/start.htm. EDF has produced a set of tools to help local leaders, residents, and businesses make their communities more sustainable. The kit focuses primarily on the environmental and pollution prevention aspects of sustainability. For more information, visit http://www.edf.org/pubs/esk/index.html. Energy.com Corporation has launched an Energy University offering free online energy courses. The first course is "Understanding Energy Deregulation." It consists of 27 lessons, a final exam, student spotlights, and opportunities to pose questions to the author. Visit the Energy University at http://energy.com/eu/default.asp. Four discussion guides focused on using the framework of sustainability to guide changes in neighborhoods, towns, and cities are now available from the Minnesota Sustainable Communities Network. To request copies of the guides, contact Phillip Muessig, Office of Environmental Assistance, 612-215-0204 or 800-657-3843, or e-mail phillip.muessig@moea.state.mn.us. A new software package developed by the National Institute of Standards and Technology and called BEES -- short for Building for Environmental and Economic Sustainability -- focuses on measuring the environmental performance of building products. The entire life of products is analyzed, from raw material acquisition through manufacture, transportation, installation, use, recycling, and disposal. Economic performance is measured using the ASTM standard life-cycle cost method, which covers the costs of initial investment, replacement, operation, maintenance and repair, and disposal. BEES can be ordered online at http://www.usgbc.org/resource/bees.htm, or purchased from U.S. Green Building Council, 90 New Montgomery Street, Suite 1001, San Francisco, CA 94105. Phone 415-543-3001 or e-mail info@usgbc.org.